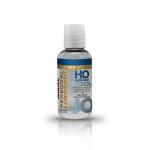 Silicone-based medical lubricant especially for HIM! Dermatologically tested for skin and mucous membrane compatibility. Without oil and fgrease. No preservatives. Colourless and odourless. Condom-friendly. 30 ml bottle.